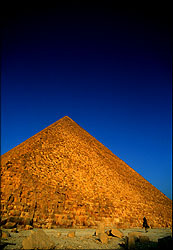 King Khufu, who is also known by the greek name "Cheops," was the father of pyramid building at Giza. He ruled from 2589 - 2566 B.C. and was the son of King Sneferu and Queen Hetpeheres. Dates Built: c. 2589-2566 B.C. Average Weight of Individual Blocks of Stone: 2.5 tons, the large blocks used for the ceiling of the King's Chamber weigh as much as 9 tons. Height: Originally 481 feet (146.5 m) tall, but now only 449 feet (137 m). WARNING upon entering Khufu: The 1908 edition of Baedeker's Egypt warns "Travelers who are in the slightest degree predisposed to apoplectic or fainting fits, and ladies travelling alone, should not attempt to penetrate into these stifling recesses."